Pros: We heavily depend on Ximble for our scheduling and time clocking system, and more for the latter. Ximble has features that other similar platforms do not offer which we mostly use: the automatic deduction of unpaid breaks in the payroll report, automatically generating timesheets/payroll reports, and the time clocking app for tablets and smartphones. The interface is beautiful, looks fresh and modern. It seemed well thought of and well planned, considering the ease of use and an overall pleasant experience. Customer Service: I think this is the BEST feature. Customer service seems to be the top priority. There is always someone available to talk to for questions and support. I never had to wait so long for a response and the responses are always thoughtful, accurate, courteous, professional and satisfactory. I have had some really BIG issues with Ximble (and NimbleSchedule) in the past but my concerns were taken seriously and immediate actions were done. It really is very important for us to be able to connect with someone when issues arise. Overall: Ximble is ever-growing and always open to changes and suggestions. It's not a system that is set in stone and it is willing to accommodate users to make the best experience and offer the best service possible. I am impressed with the quick responses and support it gives users. I think it's worth the money to have this kind of support than just handing me a software and have to deal with it myself! Cons: The switch from NimbleSchedule to Ximble wasn't as smooth as I hoped. I expected at least the bare minimum of having all NimbleSchedule features in Ximble and then more. I loved NimbleSchedule but there were issues that Ximble was able to fix so I'm not complaining! Every new software needs some adjustment period and I think I've overcome this and has learned to like Ximble so far. Because we heavily rely on the payroll reports that Ximble generates for us, it is a pain to print each report for all of our 64 employees one by one. IT would be ideal if there is an option to print all timesheets with just one click of a button (like NimbleSchedule did). We prefer the layout of the reports through the website and not the exported CSV version which looks a lot more cluttered and not easy to read. I would also prefer for fewer pages to load when clicking on buttons to save on time. (Saving time is always a plus for me). Example: When clicking "add clock in", instead of having to open a whole new page, it would be beneficial if the same page enabled a box to add this information. The "notes" section feature on the payroll report was removed but this is a vital component of our payroll reports. I requested if they can consider returning this feature. A few bugs here and there that I would always bring to Ximble's attention to get fixed and they get on it quick! Could be more user-friendly and intuitive. 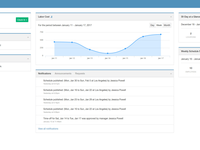 They have a lot of robust features that allow us to run reports and have a snapshot of who was late or absent for each pay period, check what breaks employees are taking, etc. NimbleSchedule also offers the ability to clock in and out with a QR code that employees have from their NimbleSchedule phone app. We printed each employees QR code and put it with their door keycard on a lanyard keycard holder. Then we have a tablet near the front desk so employees can come in the door, hold their badge up to the tablet and clock in. Then do the same when they leave to clock out. As mentioned previously, they have an admin side mobile app that uses the front camera on a tablet or mobile device that employees can use to scan their QR code and clock in or out. It works great and positioning that near the doors to our office really helps employees not forget to clock in or out and causing more work for our office admin. Overall: NimbleSchedule provides an excellent tool for business owners like myself to schedule employees and track clock-in and clock-out times. Only con that has negatively effected us is that there is no way to limit clocking in or out on a mobile device to a certain geographical area or based on IP address. They have this feature that only allows employees to clock in if they are on certain IP addresses in the desktop version. However, in the mobile app there is no way to restrict that so we had to disable clocking in or out from the mobile app. It's really not a huge deal since they can use their QR code and clock with the tablet but it would be a nice feature to have. 4.5/5 - highly recommended. NimbleSchedule works for nearly all of our needs and rarely has issues. Couple that with their AMAZING support and it is a clear winner. Recommendations to other buyers: They have a new software they released called XimbleSchedule, check that out as well as it has some features that are missing from NimbleSchedule. Comments: For a while now, the ability to track coverage for our EMS staff was a bit scattered. We never had problems with the actual scheduling -- we have a set schedule that pretty much never changes -- however it was becoming increasingly difficult to track when one person was covering for someone else's shift. It became a game of texting, guessing and questioning who was covering for whom." It was getting confusing and needed some serious help. Being a small town volunteer organization, we don't have a lot of money to spend. So finding an inexpensive solution that was also very easy for some not-so-tech-savvy people to use was key. Nimbleschedule fits the bill perfectly. I am very surprised at how many of my members actually use it. Though I do have a few items that I wish were different, overall Nimbleschedule has been a wonderful tool for our service. Pros: *Fairly easy to use - One you get a hang for what certain features do, it is very easy to use and a schedule can be set up pretty quickly. I can do a year's worth of scheduling for a dozen people in about a half an hour. *The app and web consoles are both very easy to interpret - Adding people to the schedule means I have to pay for them to use the app, whether they use it or not. The app and website are so easy for them to use, I am surprised how many of them say they actually use it regularly. *Lots of customization - I love all of the information it allows me to enter about my staff. The ability to turn certain notifications on and off for each individual is great too. It is completely customizable, which is great. *Announcements/SMS texts - Group texts are great, but can get messy when everyone starts replying. The announcements feature has been great. I use it to let people know about large span schedule changes, training opportunities and general housekeeping notes. The extra $1 per person per year is completely worth it for everyone to get a text when I post a schedule change or announcement. Cons: *Inability to turn certain features off - Since our service relies on coverage, we cannot just request time off. The shift needs to be traded. I wish I could turn off the "request time off" feature so that it doesn't get used at all. *Positions do not automatically update - I have several members licensed at an MFR level. Last year I had 1, and this year will have more who's license will increase to an EMT-Basic level. When I change their position in their profile, it does not automatically update on the schedule. I may be doing something wrong, but the only thing I have found I can do to get them to show at their new level is to delete their schedule and re-enter it. *Inability to create overnight/multi-day shifts - This is probably my biggest drawback about Nimbleschedule. Admittedly we have some pretty weird schedules. Most of my shifts are overnight and all-weekend shifts. The weekend shifts span 60 hours, and overnights are from 6 PM to 6 AM. As it stands now, in order for a shift to accurately span multiple days on the schedule, multiple shifts need to be created. It would be very helpful to be able to enter dates as well as times for shift start and end times, so that I am not creating 12 different shifts (4 different shifts (Fri night, Sat, Sun and Mon morning) for 3 people) for every weekend. Pros: Very easy to use, useful mobile app and super awesome support. We have two locations, employees often start in one and finish the day at another. I was so happy to see that Ximble allowed us to look after this complexity. 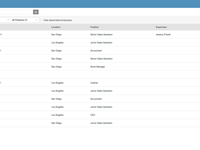 Interface is super easy and templates make "schedulers life even easier." Main reason for Ximble was deep integration with BambooHR, our main HRMS. Overall: Visibility of who's at work, where they are at now and eliminated paper timesheets. Also, team regularly takes 1 hr lunch breaks...instead of skipping them, as it was in the past. 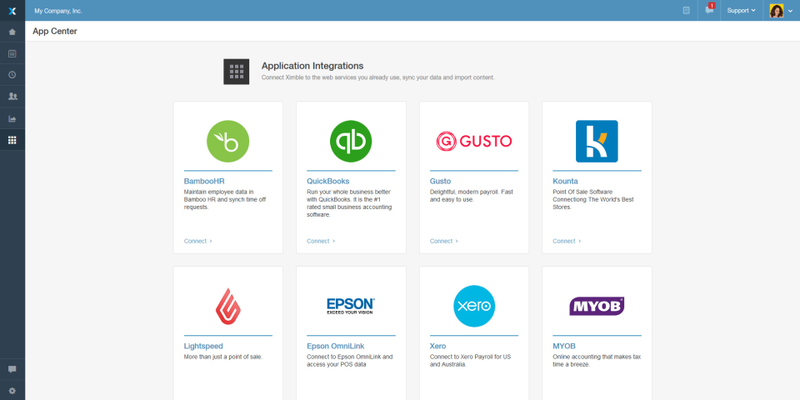 Plus integration allows a much smoother on-boarding process. Pros: In general, I am very happy with this product as the person putting together the schedules! It is easy to see when requests are put in, and it is nice that our nurses can easily pick up shifts and we do not have to deal as much with filling in open shifts. It is very helpful that we cannot double book an employee - I'm sure that has saved me countless times. I have had a good experience with Nimble for the most part. Cons: Occasionally when our employees look at the month view of their schedule, the program switches days and patient accounts. This is the biggest flaw we have encountered. It is also sometimes a pain to enter shift times, though that is becoming less of a hassle as I am becoming more comfortable with the program. On holidays, it is great that they are all entered so we cannot forget what day the holidays are, but I have found that the system also blocks out all employees as "unavailable" on every holiday. This has caused some confusion and made those days a little bit harder to deal with. I have also noticed that it is possible to double book a shift - something that we have to watch for closely but it is also helpful when we are setting up mentor shifts where we actually intentionally double book! One last thing - it is hard (depending on account label colors) to print visible calendars. Recommendations to other buyers: It took a little while for us to get the hang of making shifts in patterns - I'd advise looking at how that works right away to make the job easier! Pros: I like the ease of use, the fact I can create templates then impliment them. The chats a great additional feature for team communications. I love the fact my team can all swap/trade shifts, drop them, arrange cover, and pick up overtime shifts all without really having to come to a manager. This feature alone saves me countless hours and headaches every week! Their customer support team is awesome any issues I've ever had they have resolved for me! All in all its a great application with great potential! Cons: They are implimenting updates all the time and working on their bugs. That being said I have came across a few but they have always solved the bugs eventually. Some additional features I would add is more choice of custom availblity repeats, at the moment its only daily or weekly, fortnightly and montly would be good. Overall: Saved me hours on finding cover for shifts, arranging shift swaps, and the abilty to create a schedule template it is wonderful and saves me a lot of hours every week! Comments: Nimble Schedule is an intuitive and powerful software that makes schedules easily accessible to employees. There are some basic functions that would make the software easier to use, such as batch-deleting shifts in a more intuitive way, or auto-scheduling based on employee availability. Batch-deleting exists, but is very difficult to use; auto-scheduling also exists, but doesn't work for our purposes. These are minor complaints, however. 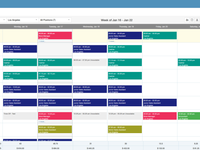 Nimble Schedule does scheduling very well, is flexible, and easy-to-use where it counts. Pros: The software is powerful, well-priced, mostly intuitive, and easily accessible for employees. It is well-built, efficient, and looks modern. Nimble Schedule's best feature is its customer service. 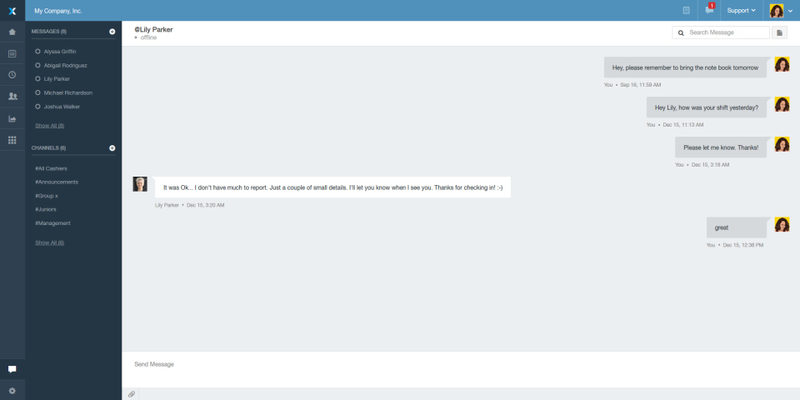 Customer service is generally available within minutes via the in-browser chat function. Representatives are friendly, respectful, and happily assist with any problems. Cons: Some of the scheduling process is not intuitive; some of the features are not fully developed or robust enough for our purposes. Recommendations to other buyers: Try out the 14-day trial before purchasing. This can really help you decide if it is right for your purposes. Pros: The online customer assistance is what I enjoy most. It is fast and I always feel taken care of when I reach out for help or when I have questions. Cons: There are two people that have to publish their staff's schedule and since they are joined, there has been issues with what gets published, cleared, etc. I would be nice to be able to divide the departments so no matter what one department does it doesn't effect the others. This may just be on our side but I wouldn't even know how to go about adjusting this. Overall: Nimble has made my life simple. When there is an issue, I have received only the best customer assistance. I can say that Nimble and its team is doing a fantastic job keeping their users happy. I am a happy camper every time I log on. Keep up the great work! Recommendations to other buyers: Not yet, Nimble has been great so far. Pros: Ease of clocking in and clocking out. Cons: A lot of the employees make mistakes of "clocking out" instead of "taking break for lunch". I do not understand why Ximble thought it was necessary to add a big CLOCK OUT symbol right above the "take a break" button when you can clock out from the main page anyway. Having to correct this mistake can get a bit annoying when a lot of your employees consistently do it. Overall: Over-all, besides the minor annoyance of having to edit incorrect hours due to placement of clock out button, ximble has been pretty painless in terms of monitoring employee hours. Being able to edit employee schedules on the app and having the app send alerts to all your employees of their scheduled hours is a big plus. Cons: There was an issue where Nimble went down a few weeks ago, and we thought our data was compromised. It wasn't, but gave us a scare. Also - I think the ability to create custom reports would be helpful, as every company has different staffing needs. Overall: We moved to Nimble from a competitor a few months ago, and have been very pleased. The reliability, easy to use interface, and speed to set someone up are refreshing. The reporting helps us manage labor cost, and hold those accountable who are absent or late. We have staff all over the world and this tool is something we've come to rely on to grow our business. Also, customer support has a cool way of sharing screenshots when they show you a new function, and they're almost always available. A professional service, that is easy to use - highly recommended. Recommendations to other buyers: It might not have the prettiest interface, but it does the trick! It is the Honda Accord of scheduling software - efficient, reliable, and affordable. a very good and easy to use application for the management of employees. Pros: ximble is a good application for the management of personnel where its main feature is the segimiento of the activity of the staff where it allows: to control the attendance of person through registries of entrance and exit. allows us to easily calculate salaries. all this from its application in a fast and easy way from the web or our iphone and android devices where it allows us to create a geographical restriction. You can take the administration of the staff easily: time worked, vacations, sick leave, absences, labor costs and many more. Cons: The only negative thing to highlight about this application is that it depends on the internet. Pros: Software is simple and it just works. We use it for employees clocking in with QR codes on an ipad and remote clock ins and scheduling and PTO. Great support and they actually take input from customers when developing the app to continually improve it based on what users actually want. Cons: The more employees you have, the more it costs. Would be nice if we got a discount after adding a certain number of employees. Like a bulk discount almost, or a rebate of sorts. Pros: Ximble has a very easy and intuitive interface for clocking in and out of work and tracking your hours. I am a big fan of clean UI and Ximble delivers in that respect. It has a very mobile friendly web page, which is good because I am not a fan of the app. Cons: I would not recommend installing the app as the location tracking is not an opt in feature. I am NOT comfortable with my employer tracking my location. If this were an opt in feature, I would likely use it. I use this software every day to schedule hundreds of employees over multiple sites. It works. Pros: The best parts about the software are the intuitive interface and relative ease that employees feel approaching the program for scheduling and clocking in and out. 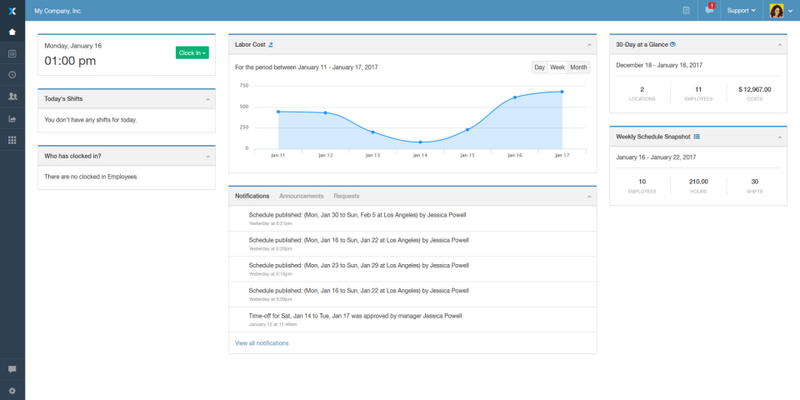 Also, the automation features like sending text messages and having an audit log of all changes to a schedule are very helpful. Cons: The data export doesn't always include all the fields that I need. Sometimes I have to go to one report to get one piece of information, and to another report to get a separate piece when performing payroll audits. Overall: Automated workflows related to scheduling, comparing time worked vs. time scheduled in an easy-to-use format, company-wide visibility of schedules, and superior customer service. Pros: Web based, tons of features. Cons: Time out session is kind of short. Overall: My company has been working with Nimble for the past 3 years, but it is now when the company grew that we are really seeing where Nimble shines. Perfect companion to my boss, he use to say, "it is my job to fill in the blank spots on the calendars!" Great tool, excellent support. Recommendations to other buyers: Set your colors and positions right from start, so you have a great overall view of the schedule. 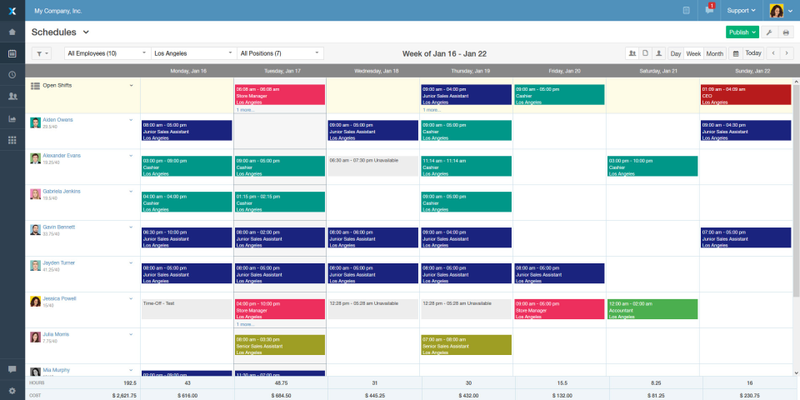 Overall: Nimble Schedule is an intuitive and powerful software that makes schedules easily accessible to employees. There are some basic functions that would make the software easier to use, such as batch-deleting shifts in a more intuitive way, or auto-scheduling based on employee availability. Batch-deleting exists, but is very difficult to use; auto-scheduling also exists, but doesn't work for our purposes. These are minor complaints, however. Nimble Schedule does scheduling very well, is flexible, and easy-to-use where it counts. Overall: We needed an app with a lot of flexibility to schedule staff and clients in multiple locations and keep them up to date of changes in real time. After reviewing and testing many other apps, Nimble was the best at accomplishing all that. We look forward to future revisions that might allow us to make changes to all repeating shifts after they've been published, and to get notifications of upcoming shifts in 15 minute increments. Overall a great app with a responsive support team. Pros: mobile app, if everything worked as proposed ease of use and clean interface. Customer service is nice to work with even if they can't help solve the issue. Cons: I was so excited when nimble schedule "upgraded" them to ximble. Because I loved nimbleschedule! The new features in ximble would be great if they worked correctly. the chat feature works in the app and not in the computer version correctly. when using the computer, my employees don't get them all and when I go into the chat log of one employee, all employees show up. 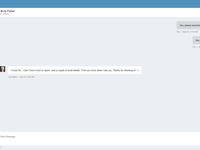 in nimble it generated an email to all employees which was ok so I was excited about the chat feature but it does not show you have a message unless you are in ximble looking for them. as a result of all of the glitches, we can not use this feature reliably. when I publish to one department only, all employees get the publish. I have 160 employees and have been using this for 1 1/2 yrs (ximble since may) and I will be looking elsewhere. there were so many glitches, in the beginning, i felt as if I was their QA person. some issues still not fixed. very disappointed. Cons: The transfer from Nimble to Ximble went really bad in 2016. Many bugs but all were fixed in time. I had allot of issues but support fixed each one with a smile. I'd like a graphical view of the schedules. Pros: I've enjoyed using Ximble. It's really easy to use. It integrates with Quickbooks and our HRIS. I also like how affordable it is in comparison to other time and attendance systems out there. Cons: They currently don't do any biometric clock-in/clock-out. Not a huge deal breaker for us. But I know that is something we were looking for initially but realized it was way out of our budget. Pros: Ximble customer service is on point. They are available 24/7 to help you with any questions you have. We use the kiosk feature and it has significantly helped us to cut back on time clock issues. The staff also enjoy clocking in and out as well as the ability to leave shift notes. I love that I can approve or deny requests for time off, cover or shift trades at the touch of a button. The app is very user-friendly. Ximble has helped me save HOURS with scheduling related tasks. Cons: Ximble does not have every feature we would like, but they are very open to suggestions and the turn around time for new features isn't very long. They are committed to creating these features and they really listen to customer feedback! Overall: Ximble saves us a LOT of time with scheduling. My employees can make requests, trade, and pick up shifts with ease and I can approve requests at the touch of a button. Pros: Supre easy to clock in and out with QR codes and remote clock in and clock outs. you can easily check your hours and alter your breaks if you forgot to clock, and the software is easy to navigate. Cons: Remote clock in and out is still available in browser, which is nice, but it really means you have to trust your team. Pros: Ability to edit staff schedules quickly when changes are needed, and also being able to see a clear view of the weekly schedule. Overall: It is much easier to keep track of, and organize schedules. Pros: This software is so easy to use, it makes keeping track of employee times so easy and it integrates with Gusto (our payroll software) and it integrates with Quickbooks if you need it. Cons: I think the interface of the scheduling could be a little easier to use. I have trouble making the shifts and then being able to edit them. Pros: It doesn't have as many bugs as some of the newer scheduling software out there. Cons: It's not the most user-friendly, it's UI isn't that impressive, and it's APP is not great. Overall: We have jumped from scheduling software to scheduling software without being entirely happy. With nimble, we are at a point where we accept what we have. We think there is probably a better solution, but we can't find it. Until we do, Nimble is a great option. Recommendations to other buyers: If you are tired of looking around and want something that will get you from A - B this is your software. Dependable, but not going above and beyond. Pros: 24 Hour Service and easy accessibility, anytime I need someone to help me customer service always answers within minutes. Most times they're the only people I can request help from because I start work at 1 AM. The features of the app are extremely easy to use as well! Cons: Sometimes the software will glitch and make it harder for me to approve a large amount of hours at the same time. However, this in comparison with overall function of the sight is minuscule. Pros: UI is intuitive easy to use, scheduling is convenient, mobile app is useful. the customer service is by far the best with Ximble. Quick responses, tutorials / trainings are very helpful. Scaleable platform as our business grows to new markets / cities etc. Cons: I am very happy with ximble thus far. There are a few features which as a user of the product and having explored and used other scheduling / time tracking softwares previously, have some features I think would elevate and enhance not only Ximbles product, but also the customers. I've spoken to client services and Ximble and communicated these suggestions. The team seems eager to implement these ideas / and continue to optimize and push their product to be the best. I'm looking forward to these features being implemented soon! Comments: A great app for those who need reminding of schedules. I communicate alot in Nimble for staff announcements. Overall a good site to use. I just wish the new platform was as easy. My eyes are used to the old app platform, but I will consider changing over soon. Cons: Nothing, everything is amazing. The only thing I wish they had was a more detailed video showing you the different ways you can deduct time for breaks but it's not a big deal cuz I was able to figure it out pretty easily still. Overall: Everything, time sheets are time stamped, employees can add notes, I can send them schedules, they can request days off and I can import schedules to save time rather than adjusting each day of work an employee has. Pros: Ximble surprised me with its breadth of features and reasonable pricing. We were hooked after taking advantage of the free trial. Cons: I never seemed to get a warning when the system was going to be unavailable due to maintenance during the period that our company utilized it. If the company sent out clear warning messages about their scheduled maintenance periods, I would have nothing negative to say. Pros: The process of clocking in is easy enough for an employee and the schedule visibility is beneficial as well, not just for me, but for employees who rely on it to cover shifts or work overtime. The development team has done well in terms of organizing schedules to be viewed. Cons: I often find Ximble is not functioning at its best capacity. While I use it sometimes, other employees rely on it much more and have reported issues in terms of clocking in or getting pages to load fully. The notifications provided to employees on the home screen are not clear-cut either. I often get notifications for positions in my company I have nothing to do with. The process of scheduling can be a bit of a nightmare as well in terms of movability. Overall: It's fine for a small company like my own. But any company with more than 60-70 employees might want to look at software that is more robust and capable of handling a bigger workload. Awesome! Best employee scheduling tool out there. Pros: The interface is great. 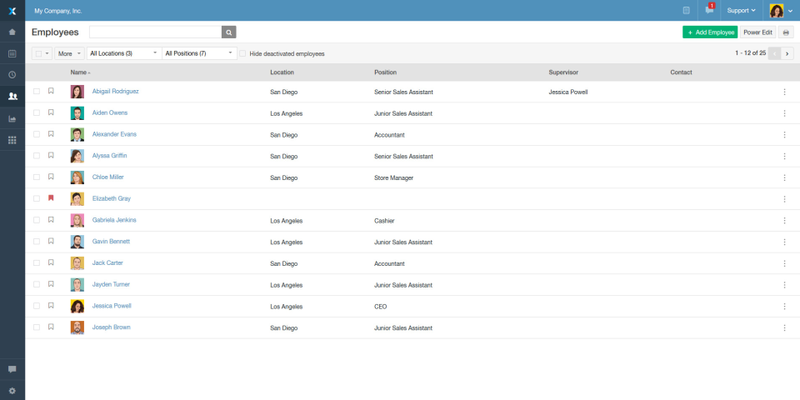 Easy to use scheduling, timecards, reports, and employee profiles. Integrated with both our POS and Payroll software. Employees love the iPhone and Android versions. Cons: Employee PIN is not very useful. and the employee can't set their own PIN. Overall: Helped up better manage our budgeted hours. Comments: We use Nimble for scheduling across our three restaurants in Asheville, NC. The tool has helped us a great deal in allowing each of our three General Managers to schedule shared employees without double-scheduling any one employee. The app has had a few glitches where it takes awhile to load but for the most part works quite well. The time clock feature has also been beneficial in allowing us to virtually approve/edit time stamps for our employees. And the customer service is the best part! There is almost always someone available to chat with online and they're speedy and efficient in their responses. We've tried other scheduling softwares and Nimble has been the best bang for our buck so far! Pros: It has great preventive features when scheduling that alert users if you try to double schedule an employee across multiple locations or if it is does not fit within the employee's availability. The time clock feature allows users to virtually approve/edit time stamps for employees with just a few clicks. The customer service is the best part! There is almost always someone available to chat with online and they're speedy and efficient in their responses. Cons: The app has had a few glitches where it takes awhile to load but for the most part works quite well. Pros: The ease of use and the excellent customer service. It is user friendly and if a question arises as to the use of the program the Nimble staff is very quick in their response time. It feels as though they are smiling in their response - always courteous and pleasant. Cons: I can't think of anything at the present time. Overall: I have been using this software for over 1 year and have nothing but positive things to say about this software program. It meets the needs of our company. The customer service is very quick in their response to questions and communicates better than any other company I have dealt with recently. I highly recommend Nimble Schedule. Pros: Ximble is easy to use, the latest interface looks nice and fixed some annoying issues. Easy team scheduling. Cons: Nothing at the moment. Overall I am satisfied. Comments: Nimble Schedule is very easy to use and works great. It has a lot of functions and settings that you can modify that other calendars don't have. The employee functions are also great like the time clock and location tracker. Will continue to use this software, we love it. Cons: -No employee tracking when they clock out, only when they clock in. -when you create a repeating event, it then makes all the events single events. If you need to modify the repeating event, you have to now modify every single event as opposed to making one change and having it be reflected on all the events. Cons: more customization of schedule. Overall: There are some areas of customization I would like to see available, but overall I am very happy with this program. Overall: Great software all around. Really useful. This has proven to be very useful to the field. We have searched other software solutions however this one is my favorite. Great time and attendance software! 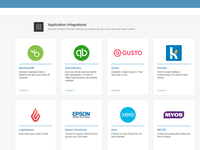 Lots of integrations. Pros: That it's simple and the sales team was so easy to work with. Great product and great company! Has a built-in integration with BambooHR! Always meets expectations. Very user friendly, expecially with the Mobile App. Pros: As a small business, Ximble provides everything we need at a competitive price. They have a plan that gives me exactly what I need. I only pay for what I need. Cons: I dislike that it can be difficult to add in a Lunch Break of 1 hour. I wish there was a preset, configurable "Take Lunch" button. Integrated very easy with my staff. Comments: I was looking for a simple scheduling solution for my valet staff to deal with shift changes, time off requests and general availability. This was the third location I had worked at where time off requests were lost in emails and the schedule was taped up to the refrigerator and would constantly be needing adjustment. I started using Nimble Schedule on my own before introducing it to the staff by filling in the weekly schedule and adding in my whole staffs availability. Once my schedules were in order I introduced it to my staff and they really appreciated how intuitive the app was. Everyone had a smart phone, so there was no issues integrating Nimble. I am notified whenever someone wants a day off, or if employees are trying to trade shifts. If I have an open shift, I can click on that shift and all available employee pop up. If a particular week's schedule had no requests, I'm able to save it as a template and use it for any future weeks. I'm very impressed at how simple Nimble Schedule was to set up and how willing my employees were to use it. I'd recommend it to any business owner looking for a scheduling solution. Pros: Wonderful interface, especially the use of colour coding. Makes it really easy to schedules at a glance even when looking at multiple employees over multiple days Very easy to use, especially the mobile apps. Integrates with most payroll packages, which is super convenient. Cons: It would be great if there was some sort of counter/system that could warn you when an employee has worked too many hours for a week. But other than it is a very good software package. Pros: This is pretty easy to use once you get the hang of the features and what they do. It's quick to set up a schedule. I can schedule 10 staff members for a period of 6 months in about 20 minutes, which I appreciate. The app and website are so easy for my staff to use, and they tell me they use it regularly. My favourite feature is the customization. I can enter so much information about my staff, which helps me schedule them for the right shifts. Cons: I sometimes find it slow or not functioning well. My employees have told me about issues related to clocking in or getting pages to fully load. Comments: Despite having grown to just over 100 employees at 4 locations since we started the company 3 years ago, we still used simple spreadsheets for scheduling our hourly workers, which is 80% of our staff. Brutal. When we switched to Nimble early in 2014, it immediately cut related HR hours by at least 10 hours/month because it works so well with our other systems (payroll, books, etc.). And we get to talk to real, live people. They loaded our data for us at the beginning and are always around for support/questions. Amazing software for the price! Pros: Great integration with our HR system (Bamboo). Notifications through the app -- weekly schedule in advance, automatic employee reminders 1 hour before their shift, etc. -- have been the big driver in our 62% decrease in missed shifts this year. Cons: Integrates only with Quickbooks online, not my desktop version. Download of data for upload into QB is smooth so it's not a huge deal, but a full integration would be nice. Pros: I like giving my crew members responsibility for their scheduling. Cons: While the product is the best product for Theater staffing that I have come across, it was not designed necessarily for Theaters. Each event is different and may require different skills sets. Right now, it would require creating many shifts to cover each duty before posting, and it would not prevent staff from requesting several different spots. Recommendations to other buyers: If assigning shifts and scheduling your staff is time consuming, Nimble Schedule is a great product and will solve most of you scheduling issues. Very convenient, excellent customer service! Comments: We just signed up for the NimbleSchedule recently, and so far, we are very pleased with its service. As all any new programs/systems, it was initially a bit overwhelming trying to learn everything! But the customer service, is excellent! They are almost always available to answer all my questions, and in a professional and pleasant manner. I am confident that I will always get help whenever I need it. I love this part of Nimble! Our admin and staff both agree that Nimble makes scheduling and filling time sheets a lot easier. We don't actually have to fill in a time sheet anymore as Nimble already has this feature of generating one for each employee! It also alleviates us from using paper time sheets, saving us paper and printing cost, and of course, making Mother Earth happier! We love the using the QR code to clock in and out - very convenient! There's a lot more to learn about the system that I'm sure will help the other areas in our company that we need to address. We are very happy with Nimble and we plan to continue using it. Pros: Simple, I like that I can see on the calendar what the assignment is. Also, the app is easy to use, understand and visualize. Cons: Well, this might be an error on my part, but as of now, the software is sending way too many emails, texts out some of my employees. I feel it's probably what I have set and am confif=dent I can change it. So really, if that clears up I have no true cons. Overall: I was changing over from 'When I Work' and the process was relatively pain free. They gave me 2 weeks trial that got extended 2 more weeks which proved to be really helpful for our transition. While I still need to work out a few things, I have been very pleased with the product. Recommendations to other buyers: No not at this time. Thanks you! Pros: Ease of use, user experience is good and not difficult to understand. Cons: Interface can be improved. The list view when approving times can get some getting used to especially if an employee clocks in and out more than average. Overall: I like it, thank you !